arcade (a) Simple regular Romanesque blind arcade with scallop-capitals and corbel-table. 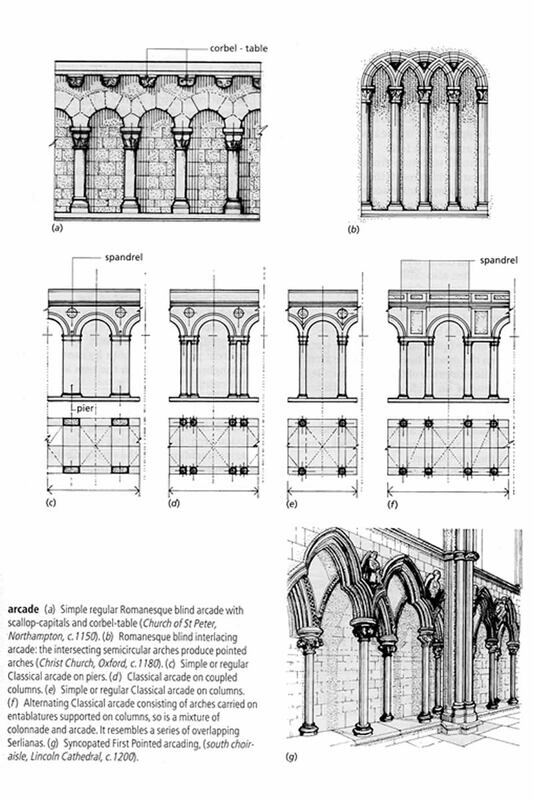 (b) Romanesque blind interlacing arcade: the intersecting elements form pointed arches. (c) Simple or regular Classical arcade on piers. (d) Classical arcade on coupled columns. (e) Simple or regular Classical arcade on columns. (f) Alternating Classical arcade consisting of arches carried on entablatures supported on columns, so is a mixture of colonnade and arcade. It resembles a series of overlapping Serlianas. (g) Syncopated First-Pointed arcading.